Come RAGE with H.A.M. 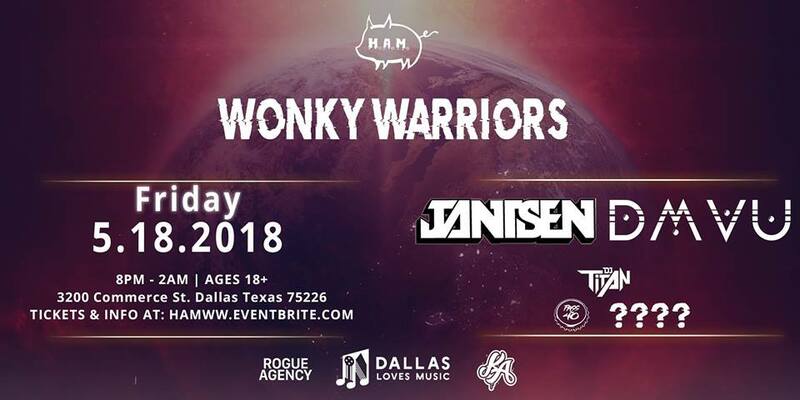 Promotions (Dallas’ Bass Enthusiasts) at the Deep Ellum Art Co. for Jantsen and DMVU along with incredible local openers (DJ Titan and Pass The 40)! Jantsen is no stranger when it comes to electronic music. This Boulder, Colorado native has been fully immersed into the dance music scene for over 12 years with his passion later blossoming into DJing and producing. Over the years Jantsen has established a strong presence in the scene through his eclectic sound , being influenced by many genres such as jazz, blues, funk, rock, hip hop, and many other kinds of world music he brings a style that is creative, unique, and is continuously evolving. Jantsen’s enthusiastic personality shows through his DJ sets through his fun , energetic, and contagious stage presence. This bass driven all star has collaborated with acts such as Zion I and Dirt Monkey, and has gained international support from some of the scenes top dj’s. With a slew of releases that are set in order, big things are sure to come in 2015, including new side project LOCOJA with longtime collaborator Bassnectar, and curating burgeoning label, Kairos Audio, alongside partner Dirt Monkey.